A rainbow is composed of the entire spectrum of colors of visible light, from the longest wavelength, red, to the shortest wavelength, violet. A rainbow is composed of the entire spectrum of colors of visible light, from the longest wavelength, red, to the shortest wavelength, violet. The order of colors in a rainbow is easiest to remember by the following mnemonic (a formula that helps one remember something): ROY G. BIV. R=red, O=orange, Y=yellow, G=green, B=blue, I = indigo, and V=violet. Red is at the top edge of the rainbow and violet is at the bottom edge, with the other colors in between. 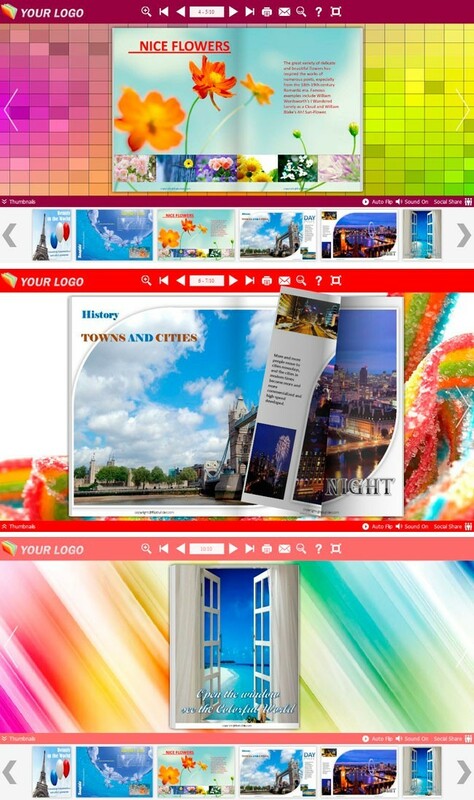 The Neat Rainbow designs Flipbook background images designed with rainbow colors, not the real rainbow shows after raining in the sky. You can use the colorful images to decorate your meaningful or interesting books. 1. Run Flip program; 2. Click Menu: File->Import Theme, select the *.thm (themes) form open dialog box; 3. Open Template Window by clicking "Classical/Float/Spread" to choose imported theme in Select Template interface; 4. Use the theme you have just imported. Note: All free Flip Themes Packages are available in any FlipBuilder software. With those Themes & Template you can make more professional and interactive Page-Flipping eBook as you want.